Between 2012 and 2016, a number of patients in Massachusetts (USA) presented to doctors with a strange syndrome of unknown cause. The original 14 patients all showed signs of cognitive issues, including orientation and attention problems, as well as an acute anterograde amnestic syndrome. As more people showed up at Massachusetts hospitals with the same condition, each with memory problems that lasted months, doctors tested for what might connect them. All had damage to the hippocampus, but it turned out 12 of the 14 patients were also found to have traces of opioids in their system. However, this alone wouldn't account for their symptoms. Now five more cases of the condition, four of these are described in an scientific article. They all had one thing in common: They all tested positive for fentanyl. 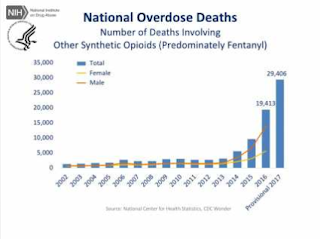 Fentanyl is a synthetic opioid, to be used as a pain medication. However, its misuse has resulted a spiraling number of fatalities per year. Provisional numbers for 2017 say almost 30,000 Americans have died from overdosing on fentanyl. They think the syndrome may be appearing to be on the rise due to an increase in fentanyl in illicit drugs. They write that fentanyl has been shown to create neuronal damage in the hippocampus of rats in previous studies, suggesting the link between the syndrome and fentanyl is likely. The sad conclusion of this is that Americans are collectively so unhappy that they are perhaps unconsciously feeling that suicide or amnesia are an answer to their problems.